Speculations on Stuxnet’s national point of origin have run as rampant as the trojan malware has within the Iranian nuclear weapons infrastructure since the discovery of the super cyber weapon by the Belarus security firm VirusBlokAda on 17 June 2010. The vast majority of those subject-matter-expert commentaries leading corporate media-driven speculations have centered on Israel and its secretive military intelligence Unit 8200 as that point of origin. Richard Falkenrath needs to have a conversation or two with his former government peers, or at the least with the New York Times’s David E. Sanger about an article he wrote a full 17 months prior to the discovery of Stuxnet. Published by the Times on 10 January 2009 Sanger’s article, headlined “U.S. Rejected Aid for Israeli Raid on Iranian Nuclear Site,” clearly references the United States as the point of origin of Stuxnet during the last year of the administration of President George W. Bush. Stuxnet. Made in the USA. For all of two years now the big remaining Stuxnet mystery has been hiding in plain sight, and now the operationally deceptive embedded “fingerprints” within the lines of Stuxnet’s code suggesting an Israeli origin are moot. And, for their part, the Israeli authorities don’t seem to have any problem with such misdirection exercises. The Israeli’s might even consider them to have some inherent entertainment value. From an intelligence perspective they do have that quality. Interestingly, it was also the New York Times’s David E. Sanger who also informed the world in another article, published 29 September 2009, of a team of Symantec researchers' discovery of a Stuxnet project string code driver (b:\myrtus\src\objfre_w2k_x86\i386\guava.pdb) that contained an apparently ingenious “paternity” reference to Israel linked to the Book of Esther. This article was published just five days after Richard Falkenrath’s accusative Bloomberg TV interview. The Book of Esther tells the story of how the Jews in ancient Elam overcame a Persian plot to annihilate them and instead turned the tables on their enemies and were granted the power to preemptively annihilate their enemies anywhere in King Xerxes realm. It just so happens that ancient Elam is the same modern day geographical location for most of the crown jewels in the Iranian nuclear weapons program. 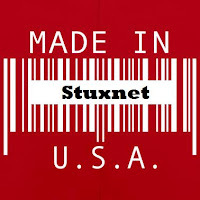 Now that’s a brilliant touch of flair the American creators of Stuxnet should receive an award for. And now it can be said that the US has finally taken a step towards rectifying all of the acts of war Iran has committed against the US since 1979 as well the murders of our Marines in Beirut and other American heroes in Lebanon.